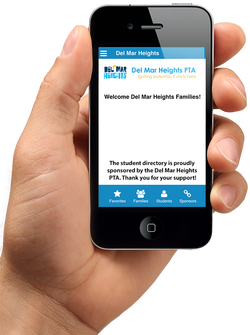 The Del Mar Heights PTA is proud to offer the Del Mar Heights Directory both on your mobile device and online. If you have not done so already, we encourage all Del Mar Heights families to enter their contact information into our secure online form where you can choose which contact information to share with our school community. Staying connected has never been easier! You can access the school directory when you need it, when you want it! In addition to the online directory available from your computer, you can access the directory from your smartphone. The phone-optimized web app makes it easy to contact parents with a click to call, text, or email. It also features Google Maps! ​The online directory allows you to search for Del Mar Heights faculty or students. You can search by student name, family/parent name, grade, or class! You can also print class lists, grade lists, or other lists. → NEW TO THE DEL MAR HEIGHTS' ONLINE DIRECTORY? CLICK HERE to add your family’s contact info into the directory. Access to the online directory is available to all Del Mar Heights families. → RETURNING TO OUR ONLINE STUDENT DIRECTORY? NEED TO UPDATE YOUR INFO? You should have received an email from mail@myschoolanywheremail.com on Saturday, Sept. 1st, around 9:35 am. The email will contain a personalized link to a secure, online form populated with your information. To ensure that you are included in this year's directory, please take the time to review and update your students' teacher, contact information, and directory preferences. If you did not receive the email, you can still update your family information by clicking HERE. If you have any questions, please don't hesitate to ask Michelle McGraw, Membership VP. ​What’s so great about the online directory? Saves time – this new system will help us publish the directory right when school starts AND we can keep it up to date throughout the school year. Printed directories will be coming soon! Reduces errors – because you enter your information yourself, you can be guaranteed that it’s what you want. Yes! All data is stored behind secure firewalls and can only be accessed by authorized users with a validated username and encrypted password. All data is viewed and passed using SSL encryption. You can choose to NOT display your contact information. Information entered is NOT accessible though search engines such as Google. Only families with students CURRENTLY at Del Mar Heights have access to the information​. The school directory is created and administered by the Del Mar Heights PTA and is intended for the sole and private use of Del Mar Heights School families, DMUSD faculty/staff, and DMSEF. It is not to be used for purposes of solicitation or publication outside of the above listed community.